Book Reviews (Feb 2014), Part I.
I don’t usually review books in this blog, but there has been such a plethora of offerings recently that deserve a word or two. We are most definitely in the Golden Age of bird books, from field guides to natural history tomes to coffee-table picture books. Like many birders, I read a lot more in the winter, and this winter has provided ample opportunity to stay inside with a good book – at least between visits with Snowy Owls and white-winged gulls! This is what I have been reading of late. I’ll post it in two parts. The World’s Rarest Birds by Erik Hirschfeld, Andy Swash, and Robert Still (Princeton University Press, 2103). Wow, simply wow. Sobering and inspiring, exciting and depressing, this is a comprehensive treatment of the 590 Endangered and Critically Endangered species from around the globe – the world’s rarest birds. Increasing awareness is the first step to improving the conservation odds of many of these poorly-known and highly imperiled species. 515 photographs plus 75 paintings cover each species, and each species entry includes estimates of population size, threats, and a paragraph of interesting and important natural history information. It’s impressive to just flip through the pages and marvel at the wonders of avian diversity, but then to step back and contemplate the myriad of threads that will dictate whether or not future generations will have these birds to marvel at. Each biogeographic region begins with a stunning photograph before getting to work, with pages dedicated to geography, conservation challenges (general and specific), threatened bird hotspots, and a summary of the most threatened bird families. The introductory material to the book is equally chock-full of valuable information, including yet more stunning photography, discussions of each of the threats, and calls for conservation. This book is a must-have for all birders and any nature lovers who care about conservation and appreciate the wonders of biodiversity. And hopefully, inspire you to act to keep this list from getting any larger. Lost Animals: Extinction and the Photographic Record by Errol Fuller. (PrincetonUniversity Press, 2013). In contrast to The World’s Rarest Birds, this is not directly a call to action. For these 28 bird and mammal species, it is too late. They are gone. Extinction is forever. One could easily get depressed from reading this book, and it is a real challenge to fight off some tears, especially when reading the supportive text that explains the circumstances of the species extinction and the last known photos. The photographs are evocative, and Errol’s engaging and accessible text tells a small part of the species story for posterity. I particularly appreciated his blunt but accurate assessment of the false report of the rediscovery of the Ivory-billed Woodpecker. Hope is a great thing, but hope is not science. I sure do hope that this bird still exists, but there’s no scientific evidence that it does. False hope is not always helpful, and takes conservation attention – and funding – away from the existent species that need it the most. The final section of the book is an appendix which features artwork of some of the birds featured in the book whose photographs are of low quality. There is something about a photograph – an actual moment in time caught forever on a piece of film – that is more haunting than colorful artwork showing a species in its full glory. Considering many of these birds are painted by referencing specimens (which in some cases added to the journey to extinction) doesn’t help, either. However, some of the art is truly fantastic, and historical in their own right…and certainly part of the stories of these lost species. It’s important to learn and understand history so that we don’t repeat it. There are 590 species in The World’s Rarest Birds that could conceivably end up in the next edition of this book. Are you willing to let this happen without a fight? I for one, most definitely am not. Lost Animals can be taken as nothing more than a history book summarizing some of what is lost. Instead, I hope you will be motivated by it and help to prevent a second volume. Birdwatcher: The Life of Roger Tory Peterson by Elizabeth Rosenthal (The Lyons Press, 2008). Yes, this is an older book, but one I simply never read until recently when a friend passed on a copy. Roger Tory Peterson (RTP) was a revolutionary. Without him and his field guide(s), many of us would not be birders. Like many birders, I started with a “Peterson’s,” and he was the single inspiration for the next several generations of birders, bird artists, and field guides. Exhaustively researched, the other chronicles the life of this great man. In addition to being an artist, birder, and photographer, he was also an inspiring conservationist. Like me, if you consider yourself a “fan” of RTP, you need to read this book to find out more about his remarkable life. Unfortunately, I found it a real challenge to get through, despite my desire to learn more about him. The book is overwhelmingly a compilation of quotations from people who knew RTP or were inspired by him. While this was quite interesting, I found the extensive use of quotes – including nearly page-sized block quotes with small italicized font – a bit of a challenge to read and follow. More paraphrasing and synthesis of the quotes in the author’s gentle prose would have made this an easier read. I was also left looking for a deeper dive into RTP’s creative process, including how he goes about his art, his chosen materials, and his philosophies. I also felt the bias in the book was slightly overwhelming, such as what at times felt like an attempt to give RTP nearly sole credit in beginning the conservation movement (yes, he was a large part of it, especially in an indirect way) and the book basically blew off his critics and detractors as mere “haters,” which for the most part is unfair. RTP is worth knowing, understanding, and appreciating – and this book will definitely help you do that. My criticisms are mostly based on a style preference, and although I found it very hard for me to read and get “into,” the wealth of information kept me motivated to the end. 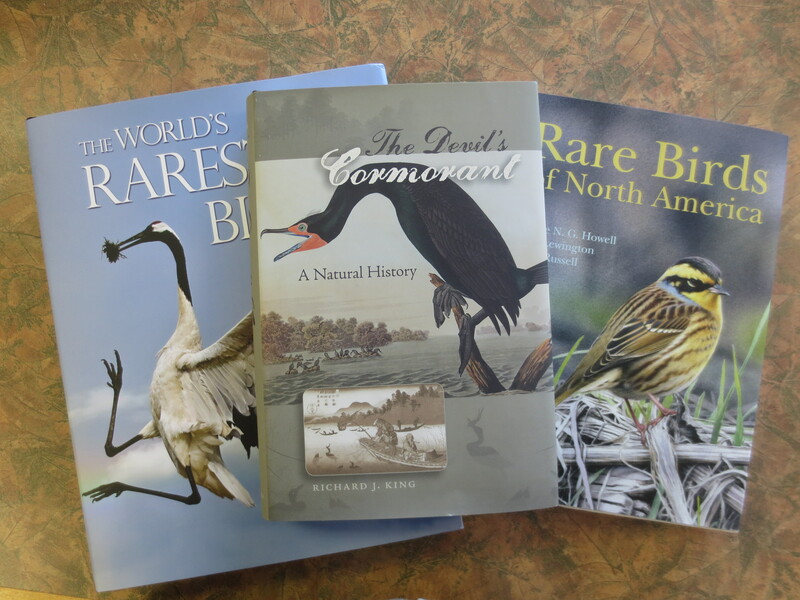 In Part II, which I will post next week, I’ll review Rare Birds of North America and The Devil’s Cormorant. This entry was posted in Reviews and tagged Andy Swash, bird books, Birdwatcher: The Life of Roger Tory Peterson., Elizabeth Rosenthal, Eric Hirschfeld, Errol Fuller, Lost Animals: Extinction and the Photographic Record, Robert Still, The Worlds Rarest Birds on February 22, 2014 by Derek.